Modern and well looked after villa with all the luxuries one would expect such as air con, large private pool with walk in steps, and an ideal location which is sufficiently away from any noise but near enough to be just a few minutes walk form the center of the town. Two bathrooms, one on the ground floor and one on the first floor. One bathroom has a bathtub and the other has a shower. Notes on accommodation: The villa has been completed during the summer of 2010 and has been furnished and maintained to a high standard. Our aim is to provide for relaxing private villa holidays sufficiently away from the noise of Coral Bay but within a short walk of the sandy beach and also the cafes and restaurants of the area. We have carefully chosen and equipped the villa with modern furniture and have maintained the property to a very high standard so that guests can enjoy their stay at the villa. The villa offers three bedrooms in total, of which two are twin bedrooms and one is a double master bedroom. One twin bedroom is on the ground floor with access to the ground floor bathroom and direct access to the private pool of the villa, whilst the two bedrooms on the first floor share the bathroom and have access to the balcony which overlooks the gardens and pool of the villa. All bedrooms have fitted wardrobes and are air conditioned. Outside: Mature garden and private 5m X 10m swimming pool with walk in steps. Outdoor dining area overlooking the pool. Full collection of outdoor furniture including sunbeds and umbrellas catering for six persons. Barbeque is also available as is a private parking drive for guests. Cleaning / Towels / Linen / Maid service: Towels and linen are provided for but please bring your own beach towels. Mid-stay clean is provided for. Other: New dining area which is open plan along with kitchen and lounge area with direct access to the shahded outdoor dining area the pool. We did say between us that if only stay for 10 nights that after 7 nights there should have been a towel and sheets change. Otherwise all ok. Thank you for your review, we do state on the brochure that mid-stays are applicable for stays of more than 10 days. I'm happy to hear that you enjoyed your stay though. The villa is fantastic has all what you need . Plenty of space inside and out. Pool is great . Easy to get the beach and walk into coral bay . Lovely villla spoilt by booking and little things. Having stopped in multiple villas for 7 years. I usually leave 5 stars and any niggles I email direct however I am extremely disappointed by this booking and I’ll explain why. Having made the booking I make sure I cover all bases, one of those being a late checkout due to flights not being until 11pm. I checked with the ‘owner’ who is actually a villa management company and completed the my stay planner which is a link they ask you to complete so I did. Sent it off and the booking was confirmed. On the second day of the holiday we had a nice visit from the maintaince company for the villa who was a pleasant English gent and we chatted for a bit and he explained what he does and what his wife does. His wife cleaned the villas and would be doing ours. I joked in saying don’t send her too early as we are late checkouts. He looked bemused and informed me that another party was coming to the villa at 5:30pm so he doesn’t think it’s correct. I emailed the ‘owner’ and asked them to confirm and sent screenshots of their own booking form which showed my checkout time confirmed as 7pm. I got one reply from the ‘owner’ which said it is 11am checkout and that’s it effectively. I sent one back but nothing more was heard and they just ignored me. As a previous villa owner myself it is a shame that the couple who really own this villa get this review as it is not there fault. The villa itself is lovely. Well set out. Exactly as the pictures show. Well kept and maintained. I would say more a 4 person than a 6person villa though the bedrooms are good for 6 the main rooms bed is a 3/4 width bed so smaller than a double. It does have a little ant problem, they seem to come from obscure places like behind the built in wardrobes and under the electric cooker top. Places that are very hard to reach. Kitchen cupboards could do with being sorted as there is not a lot of room for food and one of the fridge glass shelves has obviously been smashed at some point and not replaced making the fridge hard to store food stuffs. Pool stops getting sun from about 4pm due to the hedge location. The pool is overlooked by the right hand side neighbouring villas balcony. So not completely private. All in all yes we had a lovely time as a couple and we love Cyprus. 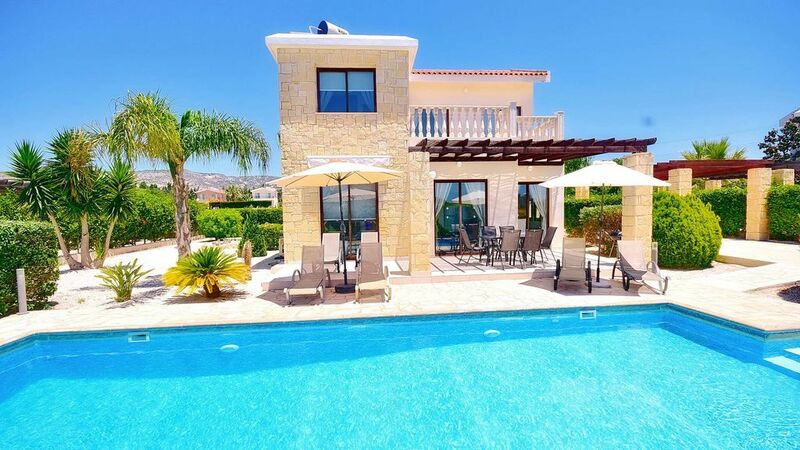 As a starter to Cyprus I’d recommend this villa definately, if experienced in going then a more secluded villa would be better for me but that’s a personal taste. I'm very sorry but due to the popularity of this villa bookings are taken (mostly) on a "back to back" basis and our check out time is 11.00 am. You filled in your arrival details online through MyStayPlanner and stated a 7.00 pm check out time which was unknown to us and was not confirmed by us. Where there is a gap in bookings we are happy to help and accommodate a late check out but this can only be confirmed by us and not by simply claiming it on the arrival details. Excellent Villa. Great Location. Reccomend. No complaints at all. Villa was all it said it was. Great facilities. Clean. All you need. Location is perfect for Coral Bay and other attractions. The sandy beach of Coral Bay is located approximately 800 meters away and offers one of the finest beaches on the island as well as various water sports. Paphos International Airport is located 25km from the villa or about 25 min drive. Upon your arrival, if you would like a taxi to collect you at the airport, we will send a trustworthy local taxi driver to collect you and he will have the keys to the villa for you. Alternatively, if you hire a car for your holiday, we can recommend a good local car hire company who will give you a good deal on car hire. The villa is located in the heart of Coral Bay and is within a short walk of banks, restaurants, tavernas, cafés, bars, and shops as well as the sandy beach of Coral Bay. Paphos International Airport is 20km away, and the nearest large town is Paphos which is located less than 10 mins by car and has a large selection of shops, restaurants and a good night life. Booking Notes: If you would like to reserve the villa pending your search for suitable flights we would be happy to take the villa off the market for you for a period of 3 days. To secure a villa booking, we ask for a down payment of 30% and the balance 8 weeks prior to arrival. Please note, for flight purposes that we ask that you move into the villa after 3pm. Payment can be made to us via cheque drawn on a UK bank, bank transfer, or through any of the major debit or credit cards. Changeover Day: Flexible Notes on prices: Please note that the rental rates are inclusive of the use of air-conditioning. Please note also that all three bedrooms are air conditioned.